The first use the modern world made of the oceans’ depths was to run telegraph cables across them. That opened up a new era of intercontinental communication and spurred a new scientific interest in the abyss. Both enterprises have prospered: single cables now carry as much as 160 terabits across the Atlantic every second; oceanographers have mapped and drilled into the ocean floor around the world. But they have not come together. 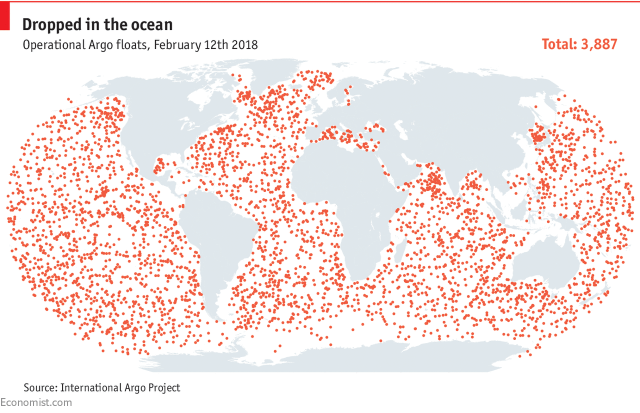 It is now very easy to get vast amounts of data from one side of an ocean to another; but it is hard to get even modest amounts of data out from the ocean itself. A new infrastructure is needed to enable sensors at sea to transfer their data back to land. Sebastien de Halleux of Saildrone, the firm whose drones keep an eye on Alaska’s pollock, dreams of doing much more than that. Saildrone recently increased its build-rate from one a month to one a day; by 2021 Mr de Halleux wants to have a thousand of his little craft sailing the seas. A full Helen of Troy’s-worth sounds extravagant. But it is important to put it into context. First, smartphone components make such boats cheap; Mr de Halleux thinks he can build the whole fleet for less than the cost of one research vessel (roughly $100m). Second, the ocean is very big. Divide its surface into 1,000 pieces and each one is still the size of Japan. That is quite a lot of ground for a single little boat to cover. There is already one research network considerably larger than this. An international collaboration called Argo has a regularly replenished fleet of nearly 4,000 untethered buoys (see map) which divide their time between the surface and the depths, drifting at the whim of the currents. Over ten-day cycles they sink slowly down to about 2,000 meters and back up, measuring temperature and salinity as they go. Their data have revolutionized oceanographers’ understanding of their subject. But the network is still sparse—one float for every Honduras-sized patch of ocean. Though restricted to the surface, Saildrone’s craft are much more ambitious. They will not just monitor temperature; they will track fish and pick up pollutants, analyse carbon-dioxide and oxygen concentrations in the water, record the height of the waves and the speed of undersea currents, feel variations in the magnetic field and more. There are already markets for some of these data: weather forecasters, fisheries managers, oil and gas companies. For others the scheme has a “Field of Dreams” approach: build the data set and they will come. Saildrone has so far raised $29m for this work. Ion Yadigaroglu, managing partner of the Capricorn Group, one of the investors, compares the company to Planet, a satellite company in which Capricorn has also invested. Planet has used smartphone technology and Silicon Valley agility to produce a constellation of over 100 small satellites. They provide images of every spot on Earth every day, allowing all sorts of new insights and monitoring possibilities. “Planet is a scanning platform for the Earth,” he says. Planet, though, has been able to build a network of ground stations to get its daily terabits of data down from the satellites passing overhead and out to customers. For Saildrone, where the data start off on the surface, the equivalent would be to build its own satellite network. This it cannot afford to do, so, like Argo, it uses satellite services provided by others. Argo can afford such satellite services because its floats produce relatively little data—a quick spurt every ten days or so. Saildrone boats produce far more, and so currently have to throw almost all of it away. Mr de Halleux says the drones’ filtering algorithms cut the data down by a factor of 60 before transmission. If the company knew exactly what data the market would put most value on that might be acceptable. But with data never routinely gathered before it does not know. Systems are also needed to get data out of the depths and up to the surface. Eamon Carrig, co-founder of Autonomous Marine Systems (AMS), based in Massachusetts, seeks to meet that need, providing “power, communications and bandwidth for other projects”. His “datamarans”, which also rely on wind for free propulsion using a solid “wing” sail, are smaller and cheaper than those built by Saildrone. They are designed to deploy sensors and buoys for third parties, such as Argo, and also to act as relays for things which can communicate only through sound. Jayson Semmens of the University of Tasmania, who tracks sharks with tiny sensors, says that what he would really like to do would be to “track animals that never break the surface, and find a way to exfiltrate data from them”. Among other things, live data from underwater animals would allow conservation biologists to manage ecosystems directly, instead of making decisions based on historical averages. It might be possible to get such data swiftly from fish to shore using a local network of AMS drones equipped with acoustic modems as an intermediary. Other schemes exist for allowing connectivity to pop up as and when needed and swim away when all is done. Jeff Smith of Riptide Autonomous Solutions, a drone company also based in Massachusetts, is working with POSYDON, a programme run by DARPA, to build a system of small torpedo drones which will swim out and create a temporary acoustic communications chain in any area of the ocean that needs it, bouncing information from drone to drone. The more of such systems there are, the wider the range of research which will be possible—especially if standards now being developed allow all the different systems to talk to each other. New buoys could add to the data Argo provides in particular places of interest without the need for a research ship to schlep out and deliver them. New types of buoy could be added, too. Last year Paul Allen, a co-founder of Microsoft, announced that he would spend $4m on 33 new Argo floats which could go down far deeper than the current ones, profiling temperature, pressure and salinity to a depth of 6,000 metres. What is most needed, though, is a new generation of satellite internet to get data from the surface to the shore. Happily this seems to be on the way. Various companies are racing to deliver high-bandwidth internet to the entire surface of the Earth using hundreds of small, cheap satellites in low orbits. SpaceX, Elon Musk’s rocket business, launched its first prototypes on February 22nd. The main beneficiaries are likely to be people in areas not served by current infrastructure. But to serve all those parts of the world, these services need to serve all the oceans, as well. With satellite connectivity available at the surface, and acoustic systems deployed as and when needed below, there would be one more thing needed to complete the picture: a map of the ocean floor. Valuable in itself, it would also be a great help to underwater vessels trying to navigate or to prospect for minerals. Being able to compare what sonar shows below you with a map stored on board would make things a lot easier. The best overall maps of the ocean floor to date have been made from space. Large underwater features like mountains and trenches exert a gravitational influence on the water above them, subtly changing the shape of the surface. Orbiting altimeters can measure those small excursions from mean sea level, and computers can use that data to infer what the sea-floor topography responsible for it looks like. This has produced maps with an average horizontal resolution of 5km—good for getting the gist of things, but little help to a drone trying to find its way. Maps made with modern sonar systems towed behind research ships are better, but currently cover only 10% of the ocean floor at high resolution. Jyotika Virmani, an oceanographer working at XPRIZE, a non-profit outfit which gives awards for technological progress, is trying to improve this. Nineteen teams from around the world have entered the competition she is running to map the sea floor without using any human-piloted craft at all. The first round of the competition asked the teams to map 100 square kilometres of seabed to a five-metre resolution in under 16 hours. Next year the second round will ask for the same resolution over 250 square kilometres in a day. Ms Virmani is hoping the whole seabed will be mapped to a resolution of 100 metres or better by 2030. That will not be an end to the mysteries of the deep. But it will mark a new era in their exploration. With easier communications from any point of the surface, a clearer idea of what lies below each of those points, and ever better sensors populating the volume in between, the oceans will be much better known. This will not make them any less marvellous. But it should make it easier to preserve their marvels.